Posted on February 20, 2013, in Paganism and tagged Deities, Goddess, Horned God, Neopaganism, Pagan, Paganism, Triple Goddess. Bookmark the permalink. 7 Comments. I’m having trouble understanding the difference between the Horned God and the Great Goddess. 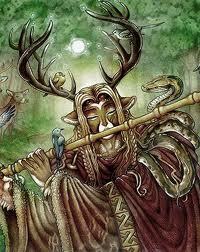 If the Goddess is all nature and the Creatrix, then isn’t the Horned God part of her and vice versa? How do you separate the two? For example, I’ve read that the Great Goddess is the Earth Mother but the Horned God is the Divine Masculine who has dominion over the woods, forest, hunting, and primal nature. Does that mean that the Great Goddess does not have “dominion” over those aspects of the earth/nature? This is confusing…. apologies for the delay in replying, I have been away from WP for sometime. You raise a good question and it can be confusing, as the nature of the Horned God and the Goddess cannot be defined through rationality and logic, but through intuition, working with them, and self-understanding. Think of them as Yin and Yang, they are seperate yet a part of each other… they exist together, completing the whole cycle, of Nature, of Masculine/Feminine. Essentially, what you said regarding their ‘domains’ is true, but it does not mean that each rules separately, simply that these are their ‘traits’. The Goddess is inherent in all Nature, yet the God is both Hunter and Hunted, competing a cycle of Nature in and of Himself. He teaches us, through this, that all of Nature is important, and is within us, that we can be both ‘prey’ and ‘predator’, yet not through greed nor malice, but in necessity and even joy. The Goddess is both Lover of the Horne God, his Death, and his Rebirth… yet all through understanding, agreement and necessity on his part… to allow Nature and the Cycles to continue. It is a partnership of equal and uneneding Power, Love, Understanding, Strength, and Togetherness. I don’t know if this helps you or confuses you further! All I can say is that for further/deeper understanding, this comes with Working with and calling on the Goddess and Horned God, using your intuition and Inner Self to understand the nature of each and how They, with Nature and Unseen Forces, integrate into a whole. I must admit I haven’t heard of that King-choosing ceremony! That is something that Neometheus and I will research – so again, thank you! And yes, the idea of equality, and honouring, and being one with Nature is what drew me to the Pagan way… more on this in a later post! Wonderful Introduction! Thank you both so much. I have instinctively felt a strong connection with Paganism, the Druids and the Celts. While reading “The Mists of Avalon” by Marion Zimmer Bradley, I was fascinated by the description of the ancient ceremony of choosing a king in ancient Britain. The candidate had to put on the disguise of a stag and run beside and then kill the alpha stag of the herd in order to prove his worthiness to lead the People of the Old Religion. In her version of the story, Ms. Bradley has Arthur engage in this process, after which he mates with one of the virgin priestesses of Avalon, thereby uniting both the People of the Land with the Druid culture of magic and mysticism. So when I saw the horns that looked like deer antlers, I understood that the Horned God came out of the Peoples’ honoring of the Natural World. Another point I found interesting is your comparison of how Paganism is viewed in Britain vs. America. I don’t know why Paganism has been equated with Satanism in America and not in Britain. Very interesting. But I do know that before I read your wonderful introduction, my mind was seeing devil’s horns on a man’s head — that is the image that has been projected into our culture to demonize the Pagan God. I am so grateful for your explanation which has relieved my mind and heart considerably. I also like the idea of honoring (equality) rather than worshiping (hierarchical) the deity. There is a natural and easy relationship in the activity of honoring, one that is easily referenced many times during the course of one’s day. Thanks again to both of you for taking the time to inquire and investigate your own understandings in order to bring forth this post to share with all of us. I look forward to the unfolding story.